Responding to the dire sanitation situation in Jordan, The Bremen Overseas Research and Development Association (BORDA) partnering with SEECON formed a consortium in November 2017, aiming at finding new innovative sanitation solutions to underserved communities in Jordan. The project called ISSRAR اصرار (meaning persistence in Arabic) “Innovation Sanitation Solutions in Arid Regions” focuses develop and implement improved sanitation solutions for Wastewater Treatment (WWT) and Faecal Sludge Management (FSM) in Al Azraq in Jordan. The innovative approach contributes to the reduction of environmental risks, creates better living conditions for the community, and maintains politically and culturally acceptable system. During the inception phase, the project has proposed a sanitation solution concept and developed an intervention strategy to ensure sustainable service delivery and the recovery of wastewater resources. The next phase will consist of the implementation of the proposed concept with building infrastructure and operational capacities; and developing a business model to ensure the sustainability of the project. The consortium will collaborate with the civil society, private and public actors to create enabling policies and behaviour change in the sector of wastewater. In order to ensure the lastingness of the sanitation services, ISSRAR seeks to establish a sanitation system that captures the value of wastewater and faecal sludge. The feasibility and success of the systems, based on “circular economy” models, is highly dependent on the political, legal and regulatory context of the implementing environment. In knowing so, the project needs to clarify the following components of the wastewater management system: ownership, and tariffs for desludging and operation. Therefore, the consortium has conducted substantive analysis of the stakeholders and official regulations to determine the setup and operational model of the sustainable sanitation system at the community level. ISSRAR consists of several operating systems: desludging, the sewer network and the WWTP maintenance. To ensure sustainability and ownership, ISSRAR will be responsible for building the capacities of local expertise to help operate them. The operation of these systems will be distributed between WAJ/Myahunai, The Azraq municipality and/or a private operator. Appropriate project planning and implementation ensures sustainability of the project and develops concrete opportunities for upscaling and replication of sustainable sanitation interventions. A successful implementation of this wastewater management system in Azraq will not be limited to the local improvement of the sanitary, environmental and socio-economic situation in Azraq. 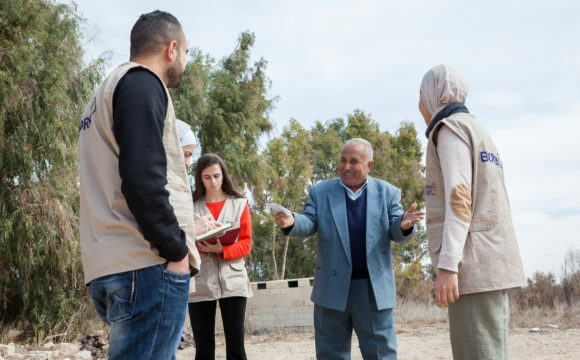 The project has the potential to demonstrate the benefits of integrated wastewater management solutions in smaller sized, rural communities in Jordan. The realization and operation of the analysed concept could show that this is a valid approach for the protection of Jordan´s natural resources. The project could not only be important for the wastewater sector in Jordan but could also function as a flagship project for the MENA region (addressing water scarcity) advocating a scaling-up of the general approach of a more de-centralised wastewater management and reuse.